Verve+ Lowstep is an electric hybrid bike designed for comfort on commutes, daily cruises and recreational rides. It features a step-through-style frame for easy mounting and dismounting and a Bosch system capable of sustaining speeds of up to 25 km/h. The E-bike comes fully stocked with accessories like integrated lights, mudguards, rearrack and a kickstand! 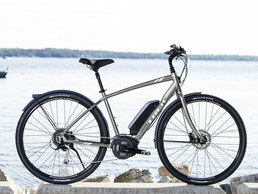 A lightweight aluminium frame with a step-through geometry, a 250-watt Bosch Active Line mid-drive motor capable of sustaining speeds up to 25 km/h, a PowerPack Performance 400 Wh battery and a handlebar-mounted Bosch Purion controller. Verve+ Lowstep is also equipped an integrated Lync light system, wide 45 c Bontrager H5 Hard-Case Ultimate tyres for extra stability, Shimano hydraulic disc brakes for all-weather stopping power, mudguards and a kickstand. Verve+ Lowstep doesn't replace your power, it amplifies it. It gives you an extra boost so you can enjoy riding more, in whatever way you choose. Quality components, a comfortable geometry and a powerful pedal-assist system make Verve+ Lowstep a whole lot of fun.